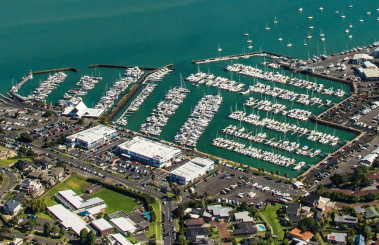 Half Moon Bay Marina is situated on the Tamaki River close to Auckland City. A short walk takes you to a small shopping centre which includes good bars and el fresco restaurants that locals and visitors enjoy. Ferry services to and from Auckland City and Waiheke Island operate from here.Travelling by ferry is a great way to enjoy the scenery and view the area from a different perspective. Maps and details of transport options and tourist information are available at the Bus and Ferry Terminal at the end of the Marina. There is a pleasant walk to the closest beach - Little Bucklands. The pathway and boardwalk is located behind the boatsheds at the opposite end of the Marina to the Ferry and Bus terminal. Musick Point is situated at the end of the Bucklands Beach Peninsular. The road to the Point is through the Howick Golf Course, and it is best to move through the golf course quickly, watching out for golf balls and golfers. 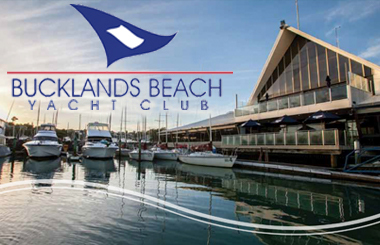 Once through the course you can relax and enjoy the parklike surrounds and lookouts on the cliff tops giving amazing almost 270 degree views across the Hauraki Gulf to various islands, the Coromandel Peninsular, the North Shore, the City, west to the Waitakere Range and further round to Manukau. The Howick Golf Course is open to visitors. Musick Point was named in honour of Captain Edwin C. Musick, an aviation pioneer in flying boats who, in 1938, was lost at sea in Western Samoa. Musick Point is of historic interest having first been occupied by the Ngariki people centuries ago. Being at the entrance to the Waitemata Harbour this was always been an important site for warning and defence. The white Art Deco building was used for radio communication by the New Zealand forces during wartime,and more recently by amateur radio enthusiasts. The area is planted with Pohutakawa trees. In early summer these trees give a fantastic floral display of red flowers. This building is not open to the public. Stockade Hill is an historic site providing 360 degree views around Auckland, and possibly the best views of the Hauraki Gulf in the whole of Auckland. Being the highest point in the area it was used strategically by early settlers to look out for invaders, and to provide a safe haven for early settler Fencible women and children. The original trenches around the summit are still visible. Stockade Hill became a public park in 1919. A war memorial is sited at the summit and honours those locals who fell during the World Wars. Events are held on Stockade Hill each year. Anzac ceremonies with commemorative crosses and red poppies every April remind us of the great sacrifice made at Gallipoli during WW1. The historic fir tree is lit up for the festive season and Carols by Candlelight are enjoyed by local families every December. Stockade Hill is a popular scenic lookout for locals and visitors, and overlooks the main street of picturesque Howick Village. Driving into Howick around Stockade Hill provides spectacular and memorable views across to the islands and the distant Coromandel. Uxbridge Arts & Culture is the Arts and Culture hub of Howick and East Auckland. Uxbridge hosts tours and fun family events as well as performances in the Uxbridge Theatre. Visit Howick’s contemporary Art Gallery here, The Malcolm Smith Gallery, The Uxbridge events programme is supported by a vibrant and exciting mix of outdoor, performance, education, fitness and community events for all ages and cultures. Tours and visits to places of interest in and around the Auckland region are a regular feature in our seniors programme. Howick Village (www.howickvillage.co.nz) is regarded by some as Auckland's “most historically conscious place” due to the relatively numerous remaining heritage buildings and other historical remnants from its early European settlement past. Locals love the quaint seaside surrounds of Howick Village. Visit boutique shops, enjoy great dining and coffee, check out art galleries, and visit the historic All Saints Church. Howick offers all the essential professional business services and healthcare experts. With amazing views from Stockade Hill, and the top of Uxbridge and Selwyn Roads, Picton Street is the main road through the Village where you can find the Saturday morning market hosted by Howick Village Business Association. Restaurants include The Apothecary, Basalt, and The Good Home to name a few. The Uxbridge Art & Culture Centre is a two minute walk down Uxbridge Road. The interactive walking allows users to discover the history of Picton Street and explore some of the nearby landmarks through a range of historic images, interactive maps and audio commentary. Mangemangeroa Walkway main entrance is at 108 Somerville Road, Howick. It is not a circular route as you can go north to Cockle Bay or south towards Hayley Lane from this starting point. The Mangemangeroa Valley has beautiful lookouts, and is steeped in Maori and early European history. The walkway runs through native bush, past mudflats, some boardwalk tracks, some parts can be muddy with some hilly farmland often dotted with cows. There is also some coastal hill climbing, and a steep staircase if you wish to leave at the Shelly Park Cruising Club. Ferries used to manoeuvre through the creek but now it’s home to mangroves, crabs and hosts of birds. Highland Park is a main crossroads taking traffic to Botany, the Halfmoon Bay Marina, Bucklands Beach and Howick Village. There are shops and restaurants of various genres in the area, including at the Highland Park Shopping Centre. Lloyd Elsmore Park is located nearby, and is a large well maintained public park that hosts many codes of sports clubs, as well as a theatre, and the Howick Historical Village. It has a walking path, a children’s playground and a bmx bike track. Howick Historical Village is a re-creation of a New Zealand colonial village using houses and cottages saved from the surrounding Auckland suburb of Howick. The buildings have been lovingly restored and give an excellent idea of the early settlement of the area. The Village is located in the beautiful Lloyd Elsmore Park. There is a café and gift shop on site. 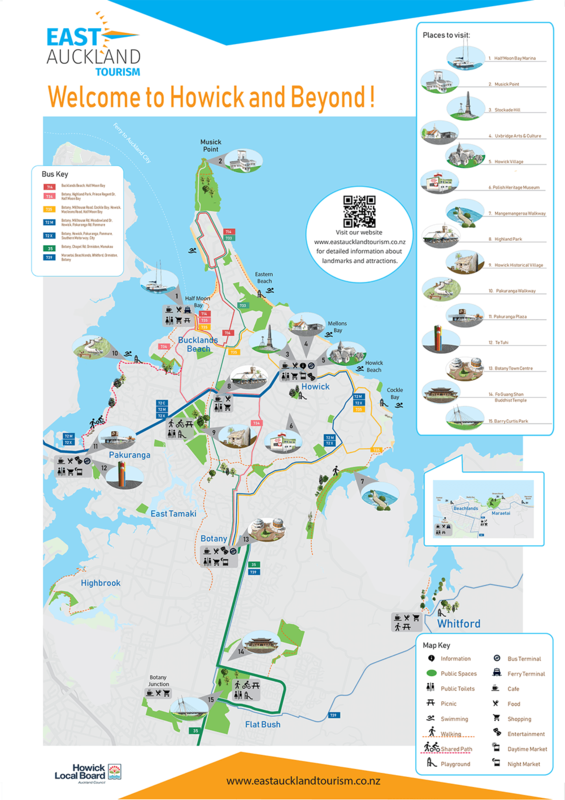 Pakuranga Coastal Rotary Walkway is an 11 km route from Panmure Bridge to Halfmoon Bay Marina. It is a scenic and high quality walk and cycleway. It can be accessed from many varying points along the route. The walkway is suitable for all – except for some steep stairs near the Halfmoon Bay Marina end of the walkway – near Clyside Drive. The track is mostly wide and paved – winding its way alongside the Tamaki River and its varied and many tributaries. You can stop and take a break on one of the many seats along the walkway. There is a snakes and ladders playground near the Bramley Drive entrance. Nearer Halfmoon Bay the walkway uses a number of existing roads that are connected by small pathways, and the way is not always clear. We recommend walking along Prince Regent Drive towards the Marina, turning left into Pigeon Mountain Road taking you to the Halfmoon Bay Marina where you will find with a good selection of eating establishments, and ferries to Auckland City and Waiheke. The walking route is also great for prams/buggies and dog walkers (on leash only). Pakuranga Plaza is located at a busy junction over the Tamaki River, and welcomes you to the Eastern Suburbs. Pakuranga Plaza consists of 75 shops, including chain stores and boutiques, and a variety of eating establishments. Te Tuhi, located adjacent to the Pakuranga Plaza, is one of New Zealand's foremost contemporary art spaces, and a leader in experimental practice. It was founded in the early 1960s by a group of forward-thinking creative women. Botany Town Centre is found at a major junction with shops on all corners. Botany Town Centre is a large shopping complex of around 200 shops, including chain stores, boutiques, restaurants and a cinema complex. A major bus station is located here. On opposite sides of the junction are other shops as well as family activities including the Paradise Ice Skating, Laser Tag, and Breakout, the Xtreme bowling alley complex, and various food outlets. Fo Guang Shen Buddhist Temple and complex occupies over 4 hectares, and was built over seven years. It was designed in the architectural style of the Tang Dynasty. The temple also includes a large Buddha statue and a two-tonne bell. The Temple is open to everyone from all religious backgrounds, cultures and ethnicities. The mission of the Temple is to promote Humanistic Buddhism "through education and teaching people how to lead good lives." The temple provides community courses such as Chinese calligraphy, Chinese language, yoga and martial arts. The carefully designed and manicured courtyard, lined with Zen gardens, elevated cherry blossom pathways, hexagonal-shaped stone lanterns, a wishing bell and statues of novice monks provokes spiritual thought. At the Waterdrop Vege Café, a traditional tea house, you can enjoy frangrant tea and vegetarian food. The Fo Guang Yuan Art Gallery provides an opportunity for locals to appreciate and interact with art, showcasing both local and international artworks all year round through a combination of beautiful Buddhism art and crafts, literature and academic studies. Barry Curtis Park, in Flat Bush, was opened in 2009 after previously being farmland (and some of the farm’s old stone walls remain). At 94 hectares, it is one of New Zealand's largest parks. As it is a new park the facilities are still being developed, and there is a lack of mature trees; some areas can be muddy after rain. The walking route is suitable for children to ride bikes and scooters, and for prams/buggies. There is a children’s playground and skateboard park. There are a lot of structures and more are being added over time.